Co-Curricular Activities (CCAs) are a crucial part of the educational process. 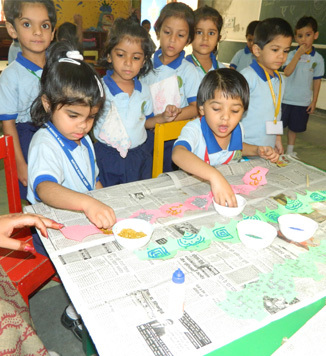 These activities provide scope for the development of creative faculties and skills. At Mayoor School, Ajmer CCAs are conducted throughout the year in the form of CCA club activities, Inter-house events and Inter-school competitions. CCAs are in line with the CBSE’s Continuous and Comprehensive Evaluation (CCE) system and help in keeping track of the holistic profile of learners through regular assessments of co-scholastic areas of development, making evaluation an integral part of the teaching-learning process and not in isolation from it. The Inter-House competitions in the Primary School are held only for grades III-V. The Inter-House CCA competitions cover a plethora of activities for the intellectual and creative engagement of the students. The unique aspect of these competitions at the Primary School is 100 percent participation of the students. The 100 percent participation is a multi-pronged strategy for the development of intellectual, cognitive and creative skills in each child. It unearths the co-scholastic talent of the child, inculcates confidence in the young children to perform on stage and infuses competitive spirit in each and every child. Another unique feature of Inter-House CCA Competitions at the Primary School is that no individual positions are given, only the house-wise positions are announced at the end of the competition. The Inter-House Hindi and English Essay Writing Competitions are conducted in the month of April every year. Students are asked to write an essay on one of the three given topics. Age appropriate topics are given to each class. The topics are given impromptu and the students have to choose a topic; creative drawing and painting follows. The first round is a written round with 100% participation. The students who make it to the second round also have to take a pen and paper round. The final round consists of three students per house i.e. twelve students in all. They face 10 rounds of questions from the quizmaster which include the audio, video, rapid fire, experiment and other such rounds. The audience also gets a question at the end of each round. Positions are given house wise. The students recite solo poetry, duet and also perform in groups. Poems written by famous poets are chosen in both Hindi and English languages. One play per house is put up by the students. In all, four plays are performed in Hindi and four in English. The children dress up in colourful costumes and portray different characters on stage. There are solo, duet and group performances. The students dress up in colourful attire and make up and present their dance performances. Various activities are conducted during the I-H Computer Competition. Students participate in card making, puzzle making and power point presentations. Students research on the given topics and then prepare presentations. There are solo, duet and group competitions in the vocal category, both in Indian and Western Music. There are tabla, xylophone and harmonium competitions in the Indian Instrumental category whereas Keyboard and Drum are major competitions in the Western Instrumental category. Various activities are conducted to enhance their creativity and skill. Rangoli Making, Clay Modelling and Flower Making Completions are held for students to display their imaginative skills. Cultural Weeks are designated weeks in the annual calendar of the middle and senior school for conducting the various literary and cultural events. The months of April and July (for classes VI –VIII) and August (for classes IX-XII) find the campus buzzing with excited and motivated students eager to showcase their talents. The involvement of students is not only limited to participation in the competitions, but also extends to planning and execution of the events. The students in-charge of the events work under guidance of the teacher in-charge to formulate the rules, audition the candidates, conduct their practices and prepare them for the competition. The student event manager makes arrangements at the venue, prepares the result sheets and compiles the final results. With varied activities such as elocutions, debates, extempore-speeches, quizzing, creative-writing and performing arts such as Indian and Western music, dance, theatre and drama, the cultural weeks provide a platform for students with different propensities to showcase their talent. Every year there are new or modified set of events and competitions that further challenge and hone the skills of the Mayoorites. At the end of the event, the individual as well as the house-wise positions are announced. The literary events harness the creative and linguistic talent of Mayoorites. The events are held for English and Hindi languages and include elocutions, debates, extempore-speeches, poetry competition, character enactment and creative writing competitions. The scope of literary events stretches far beyond the aforementioned competitions and every year innovative events are added to the list to make competitions challenging and fun at the same time. Seasoned as well as novice student artistes participate in Indian Music (Vocal and Instrumental- Solo and Duet, Orchestra and Group Singing) and Western Music (Vocal and Instrumental Solo and Duet, Band and Group Singing) competitions. The inter-house dance competitions take place for the classical, semi-classical, folk, western and contemporary dance forms. The students participate under solo, duet or group categories. Captivating and memorable performances etch the arena during the One Act Plays. Every year a theme for the English and Hindi plays respectively is decided. The students assume roles of playwrights, producers, directors and actors, costume designer, set designers and crew members. The competition also includes brochure designing by the students. Furthermore, the students are encouraged to write original plays and not just present theatrical productions. The regular events include Web Page and other designing for Classes VI-VIII and Quiz and Movie making Competition for Classes IX-XII. The scope of IT competitions is very broad and every year a different and innovative IT competition becomes a feature of the Cultural Week. Science is an enthralling field that puts an individual’s creative and cognitive skills to test. Quiz, Treasure Hunt and impromptu designing of a model using materials provided during the competition are the regular Science events during the week. Every year, new events are planned for Physics, Biology, Chemistry and Maths to present the students with new challenges for putting their respective houses in the leading positions. Mayoorites were first introduced to the concept of MUN in the year 2012 and the MUN Club was established in 2015. The students are trained in the MUN club to represent their respective houses for Inter-House MUN as well as represent the school in conferences held in schools across India.